A subsidiary of Bharti Airtel, we are India’s first Payments Bank. We are committed to serve the nation by improving financially under-banked and digitally underserved lives, through our simple, easy & accessible banking solutions. Recharging your mobile or paying your utility bill is easier than ever. A savings bank account or a wallet with Airtel Payments Bank is all that you need to pay your bills with just a tap. Now send or receive money instantly using BHIM UPI, Wallet or your Savings Bank Account with Airtel Payments Bank. Protect yourself and your family from unforeseen scenarios with Life, Accident & Two Wheeler Insurance. Also plan for a secure future with Atal Pension Yojana. Shop online, book bus tickets, buy gifts cards & more. 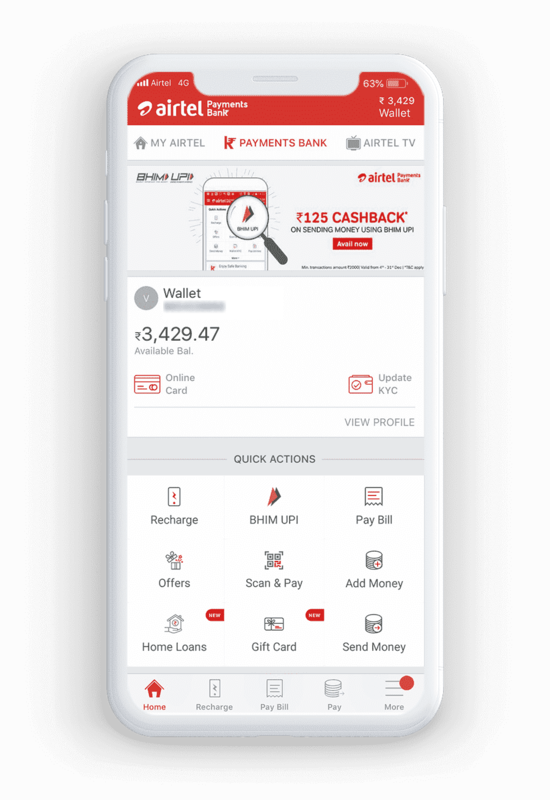 Get all you need with Airtel Payments Bank on MyAirtel app.